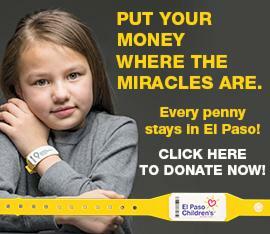 Give now to the El Paso Children's Hospital Foundation! Thank you for making a donation to El Paso Children's Hospital Foundation. The commitment and generosity of our benefactors provides a source of strength in our mission to improve the health and welfare of all El Pasoans by making high quality affordable health care available to all. Your gift provides critical support towards that goal. Donate online, by phone, by mail. Please keep me informed through future email updates. Please know that every gift makes a difference. * This transaction will count as the first month’s gift. Where would you like to apply your gift? This donation is on behalf of my company. I would like to make my donation in memory or in honor of someone. To make your donation on behalf of someone, please select the type of tribute and provide his/her name below. To notify him/her or someone else of your gift, please check “Mail a letter on my behalf” and provide his/her address. Do not disclose the amount. Security Code is a 3-digit number on the back of the VISA or MasterCard. It is a 4-digit number on the front of an American Express card. To ensure we reach your inbox, please add donors@elpasochildrens.org to your mailbox. By clicking submit your gift will be processed. Please click submit only once to avoid multiple charges. The information you submit on this page is sent over a secure connection between your computer and this server. Prefer to donate by mail? Use our printable form. Please remember to designate the area of interest you wish to benefit by writing it on your check. To donate by phone please call the EPCH Foundation office (915) 521-7229, Monday-Friday between 8:00 am and 5:00 pm. Questions or comments? 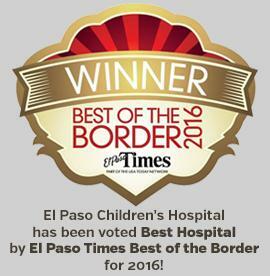 Please contact us at info@elpasochildrens.org. © 2019 El Paso Children's Hospital Foundation is a not-for-profit charitable 501(c)(3) corporation.